Handmade in California, with a hand-painted band of 24k gold or genuine platinum, the handmade Annieglass Heart Plates are food safe and dishwasher safe. 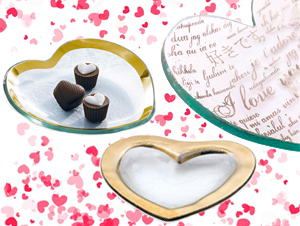 Say "I love you" with the Annieglass Sweet Nothings Heart Plate. Silk screened "I love you's" in genuine platinum or 24k gold adorn the handmade clear glass plate in dozens of languages, so that no matter how you say I love you, your sentiment is clear. Long lauded for creating one of the best shades of red in tabletop, Vietri’s Lastra Red Heart Dish meets the rich hue in this extraordinary piece perfect for your special someone. The Vietri Lastra Red Heart Mini Amore Plate is the perfect size for a small Valentine's Day gift or something sweet year-round. 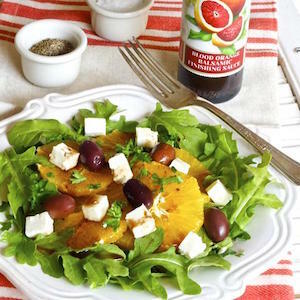 The White Ruffle Amici Plate is an adorable handcrafted treasure from the Vietri Incanto collection and will spread good will and friendship to those you love. Love is surely in the air with Lori Mitchell’s Valentine figures! 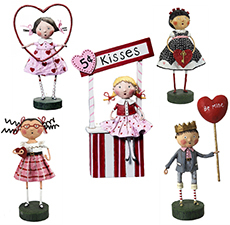 Whether you are looking for a figure that is a secret admirer, bringing you letters of love, heart balloons on a stick, or 5¢ kisses, you will find so many precious figures from the Lori Mitchell collection to decorate for Valentine’s day! 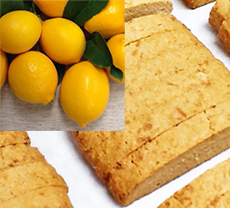 Start 2019 off with Meyer Lemon Biscotti from Roxanne's Biscotti. Roxanne bakes her perfect biscotti fresh every week in her kitchen in Morgan Hill. Roxanne’s Biscotti are hand crafted using only the freshest ingredients available, no preservatives are added.